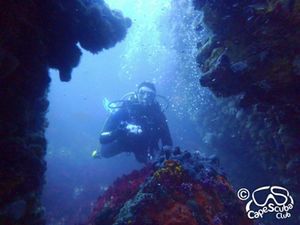 The dive site Die Middelmas or Hakka Reef is an offshore rocky reef in the Karbonkelberg headland area on the Atlantic seaboard of the Cape Peninsula, near Cape Town in the Western Cape province of South Africa. Die Middelmas is a rock that projects above the water at all tides, to the west of the Oude Schip peninsula. 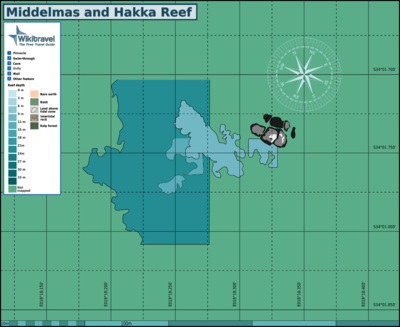 Hakka Reef is off this rock. This site is in a Marine Protected Area (2004). A permit is required. The site is within the Karbonkelberg restricted area. Also know as Middelmas Blinder. Named after the rock formation, Die Middelmas, that the site is close to. This rock formation forms a 'blind' rise which peaks about 5m below the surface. Maximum depth is about 26m. and the top of the blinder is about 5m. Average depth is likely to be about 15m. Visibility is variable, as with all sites in the region. On a really good day it may exceed 20m, and will then usually be very cold. These conditions normally occur in summer, when upwellings driven by the strong south easterly winds bring cold, clear, deep water to the surface. The good visibility does not often last long, and is usually followed by a plankton bloom soon after the wind dies down. 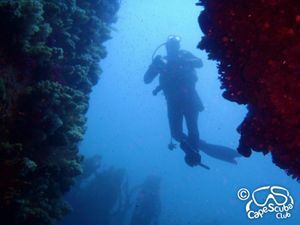 More often the visibility is less than 10m, and it is quite commonly around 5 to 8m in ordinary diving conditions. Of course it can easily be worse, and may be as low as 3 or 4m, even if the conditions otherwise look good. The site is marked by a large exposed rock beyond the tip of the "Oude Schip" point at the north of Leeuwgat, on the west side of the Korbonkelberg. The reef is around the exposed rock, and is mostly high profile granite boulders and outcrops, with sand patches in the deeper areas. The reef is exposed to the prevailing swells and there is usually significant surge. 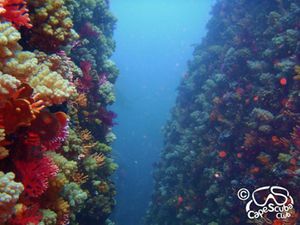 There are several narrow steepsided gullies and overhangs, and these provide habitat for the usual reef ecosystem of the area. The reef is more colourful than the interior of Leeuwgat (Maori Bay). There is some steel wreckage to the south and south west of the rock which has not been identified, though it may be part of the Bos 400, which touched this reef before finally coming to rest at Duiker Point. Geology: Pre-Cambrian granite corestones of the Peninsula pluton. This site is only accessible by boat. It is about 8.1km from Hout Bay harbour. 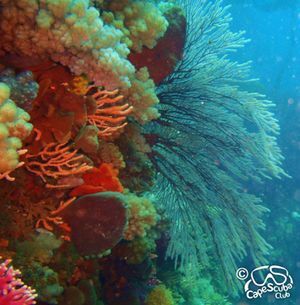 Expect to see soft corals, sea fans, hydroids, sponges, basket stars, nudibranchs and more. The shallower surfaces are covered with dense growths of Red bait, and where there is sufficient light there are lots of seaweeds, including kelp forests. Deep gullies, walls, pinnacles and swim-throughs. Some wreckage of an unidentified steel ship to the south west. There is lots of coral and invertebrate life so bring your macro lenses! Also, the rocky out crops, overhangs and vertical walls make for interesting mid and long shots. A wide angle lens will probably give best results for these. Cold water, strong surge in swim-throughs and overhangs. No special skills required, but because of the strong surge and delicate corals and invertebrates, good buoyancy control and finning techniques are essential. This site is not recommendsd for novice divers. This page was last edited on 24 February 2012, at 15:49.